Today I did a lot of Christmas baking, so I thought it would be fun for Ethan to help out by decorating his own little gingerbread men. There are these great Gingerbread Men that are all organic with no sugar in them made by Goodies that we love, so that made it easy. I used fromage frais instead of icing and some dried cranberries and raisins to decorate them. Ethan was fascinated by it, it's very different than anything we've done before. Of course he took a bite of the gingerbread man straight away, but he was also very intrigued by painting on the yogurt with a pastry brush, and then licking the brush! 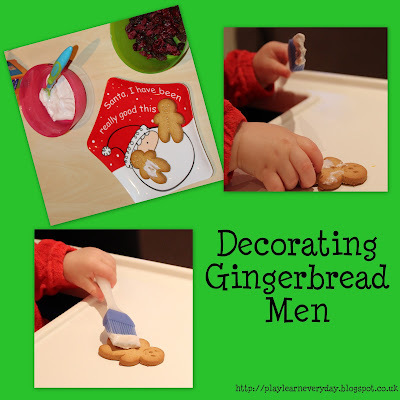 It's a great activity for Creative Development as he really had free reign of how he wanted to paint the little men and decorate them with the dried fruit.